Help spread the word! I’d love to have you join my awesome street team! Have the chance to be on the review team. One of the ways authors get out word about their books is by advertising, but getting a spot with some advertisers can be difficult unless you have a large number of followers. So it really helps me if you follow me on their platforms. What that means is you’ll receive an email only if they ever advertise one of my books for a discount or if I have a new book out. So we both win! Click on the links to follow: Teyla Branton on BookBub | Rachel Branton on BookBub | Teyla Branton on Book Cave | Rachel Branton on Book Cave. I often hold drawings for readers who send me links to reviews they’ve written. You get an entry for each review you leave on any major retailer (so if you review one book on four retailers, that’s four entries). Plus I often have some kind other kind of fun reader giveaway going on. 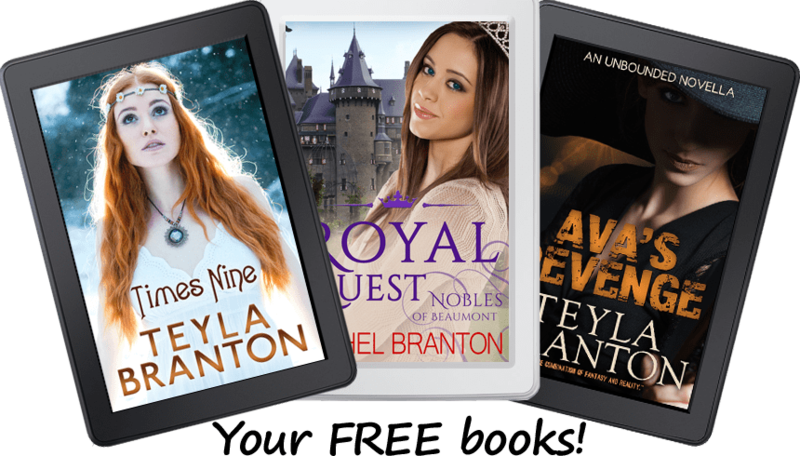 Join Teyla Rachel Branton's reader group today!